To learn more about Carl Palmer’s latest art, exhibitions and appearances, please join our interest list by providing your email address below. Each of the 250 books in the First Edition feature an art piece by Palmer titled “Art in Rhythm.” Click to enlarge. book of his rhythm-on-canvas works. journey with bringing rhythm to a visual over more than four decades. individually signed by Carl Palmer. This is the second published release by SceneFour, Inc.
please join our interest list by providing your email address below. World renowned Rock Drummer Carl Palmer talks in depth about his incredible pieces of artwork called The “Rhythm of Light” as well as many other stories from his incredible career with Crazy World of Arthur Brown, Emerson Lake and Palmer and who influenced him as a Drummer and Artist. Carl Palmer, one of rock’s iconic figures, and a founding member of both Emerson Lake & Palmer and ASIA, in association with Los Angeles art company Scene Four, recently completed a three day run of successful art exhibits in Rochester, NY; Bath, PA; and Philadelphia PA, May 2nd, 3rd, and 4th, respectively. The events resulted in the sales of 23 original Palmer canvases, whose proceeds will be distributed to three very worth causes that Palmer is supporting: Camp Good Days & Special Times ( a summer camp for children with cancer); The American Cancer Society; and The Child Advocacy Center of Philadelphia, which aids abused children in the Philly area. Palmer, the legendary drummer and band leader has released his new signature collection of fine art, THE RHYTHM OF LIGHT, created completely from rhythm. Rhythm Of Light is a series of signed and numbered prints on canvas featuring stunning visual images constructed from drum performance. Working with acclaimed L.A. art team Scene Four, the artwork featured within combine motion, color, and lighting into some of the most compelling fine art visuals ever created.Palmer is scheduled to launch a on mini- tour with his solo band, CARL PALMER’S ELP LEGACY in June, and remains a current member of the British super group, ASIA. have been touched by cancer and other life challenges. All of the programs and services provided by Camp Good Days are offered free of charge for the participants, which is only possible through the generosity of so many individuals and organizations and the success of our many special fundraising events. Camp Good Days provides residential camping programs at its beautiful Recreational Facility, located on the shores of Keuka Lake in Branchport, New York, as well as yearround recreational and support activities, in the Rochester, Buffalo, Syracuse & Ithaca ,New York areas for entire families who are facing the toughest challenges of life. sickle cell anemia, or violence has taken away from them. As the largest voluntary health organization in the United States, the American Cancer Society is committed to saving lives and finishing the fight against cancer. We combine our relentless passion with the wisdom of over a century of experience to make this vision a reality, and we get results. More than 1.5 million lives have been saved in the US in the past two decades. The American Cancer Society, Inc., is a 501(c)(3) nonprofit corporation governed by a single Board of Directors that sets policy, develops and approves an enterprise-wide strategic plan and related resource allocation, and is responsible for the performance of the organization as a whole, with the advice and support of regionally based volunteer boards. support, technical assistance, and quality assurance for CACs, while serving as a voice for abused children for more than 25 years. A children’s advocacy center is a child friendly facility in which law enforcement, child protection, prosecution, mental health, medical and victim advocacy professionals work together to investigate abuse, help children heal from abuse, and hold offenders accountable. A new medium in visual art. The most limited release imaginable. Carl Palmer, one of rock’s iconic figures, and a founding member of both Emerson Lake & Palmer and ASIA, is scheduled to release his first signature collection of fine art, created completely from rhythm. Twist of the Wrist by Carl Palmer is a series of signed and numbered prints on canvas featuring stunning visual images constructed from drum performance. Working with acclaimed L.A. art team SceneFour, the artwork featured within combine motion, color, and lighting into some of the most compelling fine art visuals ever created. 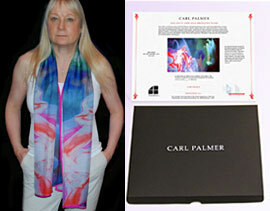 This very limited art collection is available at www.CarlPalmerArt.com starting on February 1, 2013. 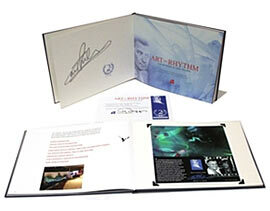 They will also be available in selected art galleries and at Carl Palmer shows during his extensive 2013 tour. 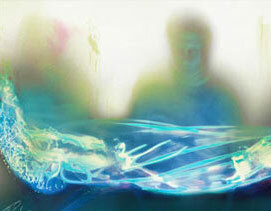 “I think viewers will be amazed when they see Carl’s rhythmic approach and symmetric motion put to canvas. It captures a new dimension, not of this world,” SceneFour Art Director Ravi Dosaj states.